Values shown in this price guide reflect the actual selling price in the venue stated (in parenthesis after the value). Prices realized for similar collectible jewelry sold in other venues may be higher or lower depending on market fluctuations and geographical region. Crystal necklaces were like strands of pearls, everyone had one in the 1950s. Being so versatile, they are popular with fashionable ladies today as well. Continue to 2 of 59 below. Bogoff bracelets are harder to find than other pieces by this manufacturer. Continue to 3 of 59 below. This piece has an Art Deco influence but it's actually much newer, which is referred to as Deco Revival. Continue to 4 of 59 below. Ciner is a ​high-quality jewelry manufacturer still doing business today. Ciner vintage pieces are prized by collectors. Continue to 5 of 59 below. This Coro design was patented in 1948. Continue to 6 of 59 below. This is a hard to find, desirable Coro piece, hence the high price. Most Coro items won't sell anywhere near this range. Continue to 7 of 59 below. From a series of angel birthstone Duettes and coordinating bracelets made by Coro in 1956. Continue to 8 of 59 below. This is a popular Coro design patented in 1948. Continue to 9 of 59 below. This DeMario piece was marked with the DeMario oval cartouche with a copyright symbol. Continue to 10 of 59 below. This piece is dated 1964 and marked Chr. Dior Germany on the signature cartouche. Continue to 11 of 59 below. Christian Dior brooch signed "Chr. Dior 1958" featuring iridescent rhinestones known as aurora borealis. Continue to 12 of 59 below. This pot metal piece fastens to a garment with a double-pronged clip known as a fur clip to collectors but found in patents noted as a pin clip. Continue to 13 of 59 below. Continue to 14 of 59 below. Continue to 15 of 59 below. Marked "Miriam Haskell" on an appliqued oval tag. Continue to 16 of 59 below. Miriam Haskell pieces combining colored rhinestones with faux pearls are more uncommon than pearl and clear rhinestone pieces. Continue to 17 of 59 below. Continue to 18 of 59 below. Miriam Haskell pieces like these earrings made entirely of rhinestones are not commonly found. Continue to 19 of 59 below. Marked Miriam Haskell on the necklace hook and on the back of the findings. Continue to 20 of 59 below. Marked "Hollycraft Copr. 1958." Large foiled cabachons are often referred to as "cat's eye" stones by collectors. Continue to 21 of 59 below. This is an unusual color combination for Hollycraft jewelry. Continue to 22 of 59 below. Hollycraft brooch in typical antique goldtone setting dated 1953 on the reverse. Continue to 23 of 59 below. Juliana jewelry is not signed, but select pieces can sometimes be found an original hang tag. Continue to 24 of 59 below. Parure is the collector's term for three or more matching pieces. Continue to 25 of 59 below. Parure is a French term for three or more matching jewelry pieces. Continue to 26 of 59 below. Aurora borealis (those with an iridescent finish) rhinestones were not introduced by Swarovski until the mid-1950s, which helps date many costume pieces. Continue to 27 of 59 below. Juliana is the collector's nickname for unsigned jewelry manufactured by DeLizza & Elster. Continue to 28 of 59 below. DeLizza & Elster marked only select pieces of jewelry with "Juliana" hang tags leaving most unmarked. Continue to 29 of 59 below. Juliana, manufactured by DeLizza & Elster, is unsigned but recognizable due to the construction of the piece. Continue to 30 of 59 below. The dangle beads on this set are often referred to as fruit. Parure is the collector's term for three or more matching pieces. Continue to 31 of 59 below. Juliana is a collector's name for unsigned jewelry made by DeLizza & Elster. Select pieces were originally marked with paper hang tags. This Juliana bracelet exhibits the typical five-link​ and band construction on the reverse. Continue to 32 of 59 below. Aurora borealis rhinestones indicate this brooch and earring set was made after 1955. Continue to 33 of 59 below. Signed "Kramer of NY" on the necklace, "Kramer" on the earrings. Rhodium plated. Continue to 34 of 59 below. White jewelry was popularized by Dior in the 1950s, and other designers and manufacturers followed suit. Continue to 35 of 59 below. This style of jewelry is commonly referred to as "retro" by collectors and dealers. Continue to 36 of 59 below. This Napier "boutique" jewelry set was made in very limited quantities and rarely comes on the market. Continue to 37 of 59 below. Signed Napier brooch featuring black rhinestones with aurora borealis accents in a heavy goldtone setting. Continue to 38 of 59 below. This Napier necklace made up of clear crystals and goldtone beads feature a flattering Egyptian Revival influence. Continue to 39 of 59 below. Oval baroque pearls were commonly used by Regency in a number of colors. Continue to 40 of 59 below. Regency signed bracelet featuring stones of exceptional quality. Continue to 41 of 59 below. Signed "Regency" on oval plaque. A set of two or more matching pieces is also referred to as a demi-parure. Continue to 42 of 59 below. This is a 1940s imitation of a very finely crafted and well-made Hattie Carnegie design. This one by Reinad, while beautiful, is not as nicely detailed. Continue to 43 of 59 below. Sandor mark indicates jewelry manufactured by Sandor Goldberger. The terms brooch and pin are often used interchangeably with pieces like this one. Continue to 44 of 59 below. Unsigned Schiaparelli necklace in excellent condition, unsigned bracelet with repair and single signed earring included for identification purposes. Continue to 45 of 59 below. Continue to 46 of 59 below. Schoffel pieces made in Austria are marked only with a crown logo, but have the look of other pieces often found marked "Made in Austria." Continue to 47 of 59 below. Schreiner vintage pieces remain popular with collectors due to their beautiful use of stones and excellent craftsmanship. Continue to 48 of 59 below. This piece has wings mounted on springs making it move slightly when worn, thus the term "trembler." Continue to 49 of 59 below. Cabochons are the stones with rounded tops rather than facets. This set is unsigned but attributed to Schreiner due to construction characteristics. Continue to 50 of 59 below. Brooch is marked "Schreiner New York", earrings are not marked. Corners of the brooch turn upward for a three-dimensional effect. Continue to 51 of 59 below. Brooch signed "Schreiner New York" featuring high-quality rhinestones. Continue to 52 of 59 below. Funky charm bracelets from the 1950s have been gaining popularity recently and prices are on the rise. Continue to 53 of 59 below. This piece is an example of Trifari's prime work. It is considered a rarity in the costume jewelry world and is highly sought by avid collectors. In spite of this brooch being incorrectly labeled as a "jelly belly" in the online auction description and having a few minor condition issues, this piece brought top dollar on eBay. If it were a true jelly belly (a collector's term describing pieces incorporating clear lucite cabochons or components in the design), it would have sold for even more. A similar example with Lucite wings was documented selling in the $17,000 range at a live auction in years past. Continue to 54 of 59 below. Mark (Crown over the "T" and no copyright symbol) dates these pieces to the late 1940s. Necklace and bracelet can be attached together for a longer necklace. Continue to 55 of 59 below. This set consisting of a number of matching pieces would be referred to as a "parure" by collectors. It is in mint condition. Continue to 56 of 59 below. This is an extremely rare Trifari piece that came in several different colorations, including goldtone with no enameling. Continue to 57 of 59 below. A Trifari brooch of good quality, typical of Trifari's mass-produced pieces from the 1950s. Continue to 58 of 59 below. 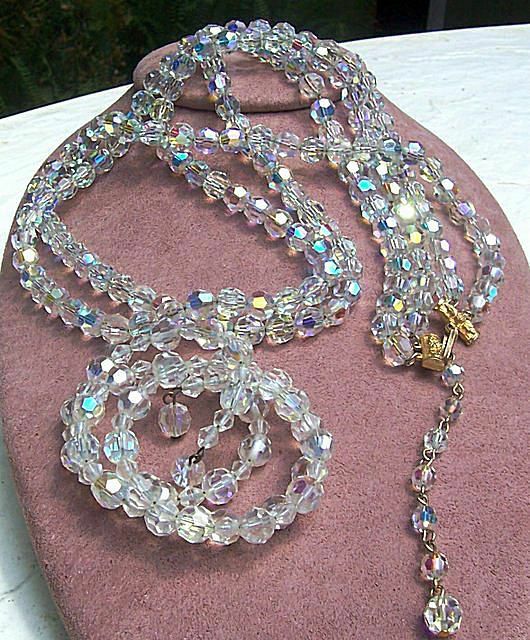 Vendome, a high-end division of Coro, was known for making beaded necklaces more often than rhinestone pieces like this necklace. Continue to 59 of 59 below. A typical pin marked "W. Germany" made using stamped filigree, rhinestones and pearls. Similar pieces were made using a variety of stone colors.